Welcome to the Beede Center’s December newsletter where we focus on time, more importantly endings and beginnings. This month marks the end of the long dark nights and the beginning of long, bright days. Friday, Dec. 21 marks winter’s official first day. Ten days after marks the end of 2018, which has been a fun and prosperous year for the Beede Center, and we hope, for you too. We look forward to 2019, which unfolds a few short weeks from now. We will share wise words from contemporary Concordians (and former Concordians), some of whom are working out alongside you here at the Beede Center. You never know who you’ll meet on your journey to good health. December 25 - Beede Center is closed. Some may consider us quoting Tommy Glavine as a Concord resident a bit of a stretch, because he really grew up in Billerica. But the fact remains he was born here at Emerson Hospital in 1966. So, we’re counting him as a former resident. He also makes the perfect intro for us to brag about our own lifeguard Mike Sivo, our resident Red Sox affiliate. 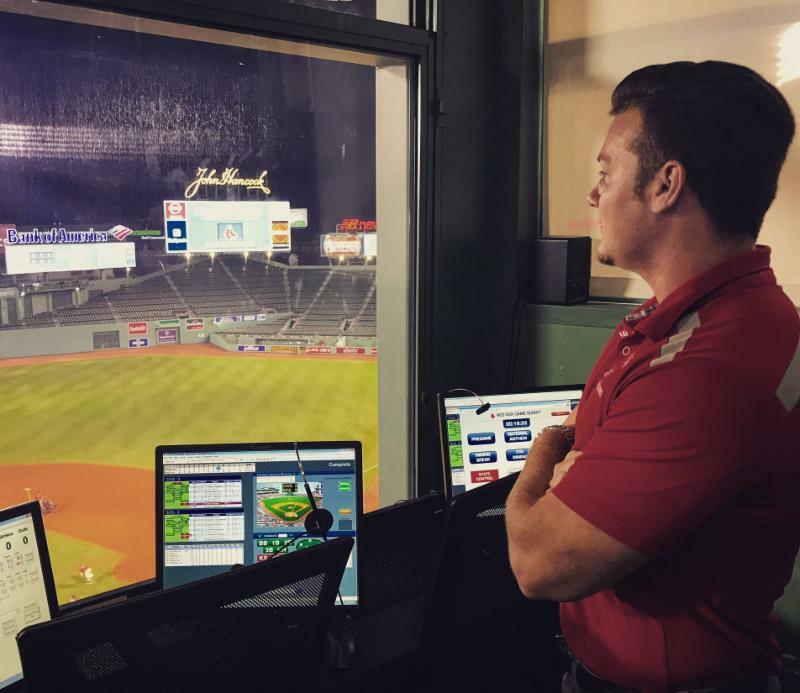 Mike splits his time between keeping an eye over the Beede pools and looking out over Fenway Park, pictured above. Mike had the distinct honor of being part of the Red Sox ninth World Series win, and the parade. Congratulations Mike! The Beede Center pool is the proud home to the CCHS Patriots Swim Team and the youth league Otters. Through regular competitions, members of both teams produce standouts that move up to swim for the NCAA or a competitive high school team. Members of both teams regularly qualify for state tournaments and AAU competitions. We are very proud of all our young swimmers’ accomplishments. Who knows where these competitions may lead? We do host a series of meets. Below is a list of upcoming meets held here at the Beede Center. Please keep it handy so you’re aware of when we must dedicate the entire natatorium during meets. Also, the parking lot is usually very full during a meet. Dec. 11 v. Waltham 4 p.m.
Dec. 18 v. Newton South 4 p.m.
Dec. 21 v. Bedford 7 p.m.
Jan. 4 v Wayland 7 p.m.
Jan. 18 v. Weston 7 p.m.
Jan. 22 v. Cambridge R&L 4 p.m.
Dec. 8 v. Flaherty 4 p.m.
Jan. 5 v. Mystic Valley 4 p.m.
Jan. 12 v. Suburban 4 p.m.
Jan. 26 v. Hayden and Wayside 4 p.m.
Feb. 2 v. Thoreau 4 p.m. Please note that meet dates are subject to change. As noted above, winter officially begins on Dec. 21. The meteorological winter, however, begins when it wants. We have already experienced winter weather and are sure to expect more. Heavy snowfalls may necessitate our opening late, closing early or not opening at all. We will make this decision in concert with the Town Manager’s office and the Public Works Department. Once a strategy is decided, we send you an email, update our voice mail on 978-287-1000, and social media. Safety is paramount. We need to clear and sand walkways and the parking lot before slush freezes into place. Many thanks in advance for your understanding. Congratulations to Beede member Eugene Delsener for completing his first Marathon, and a big one, at that. Last month Eugene completed the 2018 New York Marathon, along with his daughter, CCHS 2010 grad, Kathy Delsener. Recently retired, Eugene set a goal for himself to cross the finish line of a major marathon while simultaneously supporting a cause close to his heart: homelessness. Eugene and his family are staunch supporters of Back on My Feet , a nonprofit whose supporters run to raise money to finance safe homes as well as job and community support for individuals who do not have those bare necessities. Eugene began his tandem adventure by first doing run/walks with other supporters of Back on My Feet , then transitioned to half marathons, most recently the Portsmouth Half Marathon. He then set his sights on New York. Knowing that 13.1 times 2 is a more significant increase than it appears on paper, Eugene set up a training regimine. He hired Personal Trainer Bill Lehmann to condition him for the big race in the Big Apple. 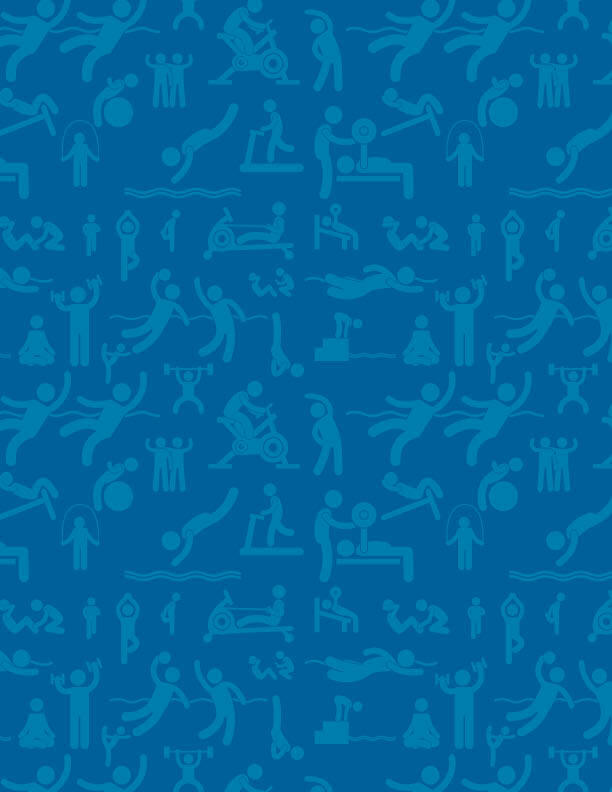 Bill, who has run his share of marathons, set up a schedule of weightlifting, swimming, aerobic exercise and predawn runs on hills and the track at Emerson Field. The discipline paid off. Confident he’d finish the historic marathon, Eugene took time out to pose for photos and celebrate with friends and family along the route. “It was just a fun day,” an exuberant Eugene said just days after his 26.2-mile run through NYC’s five boroughs. Congratulations to Eugene for not only fulfilling a life goal, but going the extra 26.2 miles to help so many get back on their feet. Our new fitness studio is already going strong! We began classes the week of Nov. 12 and the Monday morning Pilates class with Cheryl Owen is already filled! We have obviously hit a niche. We also offer Form and Flow Yoga with Tina Terry on Wednesday nights at 5:15 to 6:15, and Wake Up Yoga with Elisabeth Lansac every Friday morning 6:30 to 7:30 a.m. 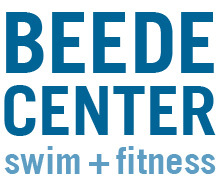 Classes are $63 per session for members of the Beede Center and $81 for non-members. Try a class for a $15 Drop-in fee. This schedule runs through the winter solstice on Dec. 21. One of the important qualities that I think is often overlooked is just energy. It's vitality, and sort of a life force that some people have and others don't. Probably that is connected to a love of whatever it is that they're doing. Another quality that I think is central is confidence. We are so pleased to introduce Amanda Smith, who began work as our Program Manager last month. Amanda brings a wealth of experience and new ideas from both her 14 years as aquatic director at J. W. Hayden Recreation Centre in Lexington and her own days as a competitive swimmer for her high school and college. “Butterfly is my favorite,” Amanda said, adding that though she no longer competes, she remains a staunch advocate for the crucial value of swimming lessons. “Everyone should know how to swim to reduce the national drowning rate,” said Amanda. “Each lesson can help you save a life or help you save yourself.” Being comfortable around water also makes pool parties and beach vacations that much more enjoyable. No one can argue with that. One of Amanda’s many goals for the Beede Center is to create lots of youth and family programs. Aquatics is but one slice of Amanda’s life. She and her husband are the proud parents of Abby, 7 and Hannah, 3. As a family, they enjoy participating in Revolutionary War reenactments. Abby and Mike march in the Lexington parade every year after Mike participates in the Battle Green reenactment. Amanda sings with the Colonial Singers. To really bring their passion home, the Smith’s live in an 18th Century house. The Beede Center is home to a drop-off box for holiday gift donations, a service of the Concord Carlisle Community Chest. Please bring a brand new, NEVER OPENED toy to donate. Please be mindful of the recipient. If a child you love would enjoy your donation, so will a child you never met. If a child you love would be insulted by your donation, so will a child you never met. All gifts will be donated to low-income Concord families. Donations for children from newborn to teens are greatly appreciated. 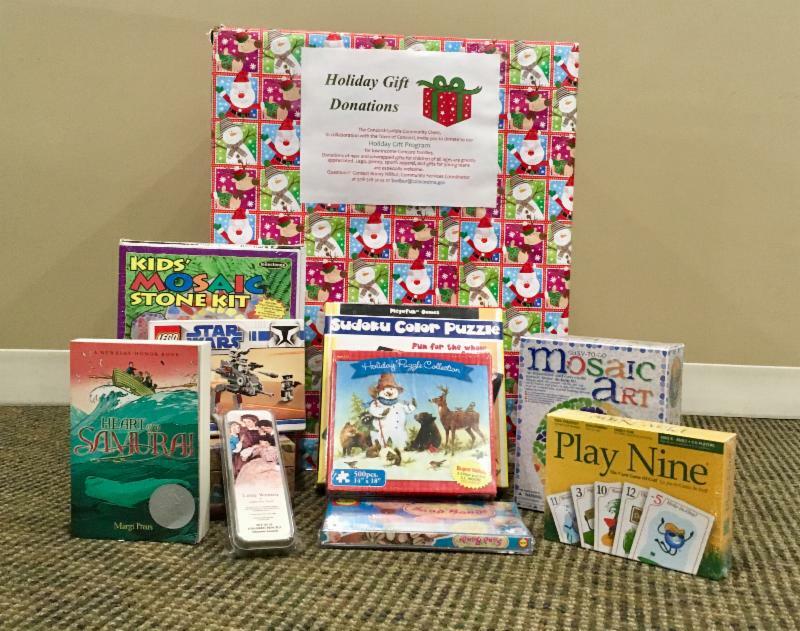 Many of our donations tend to be geared to smaller children, but tweens and teens are looking forward to a joyous holiday season, as well. This marks the END of our newsletter for December 2018. Our staff wishes you all a safe and happy holiday season and a warm, healthy introduction to the new year.